Mr. John (Frank) Dirks III worked as a community organizer in Michigan advocating for youth engagement, and leading the coalition of individuals and interest groups committed to institutionalizing support for volunteering. Mr. Dirks helped set up the Michigan Community Service Commission, which was formed as an initial national model prior to the passage of the authorizing legislation that established commissions in each of the 50 states. As an organizer, activist, and participant, Mr. Dirks has the history and insight on how MCSC developed. Mr. Frank Dirks talks about his career in philanthropy. Mr. Frank Dirks talks about the beginning of the Michigan Community Service Commission (MCSC). Mr. Frank Dirks talks about how leaders in Michigan helped contribute to Michigan's philanthropic legacy. Mr. Frank Dirks talks about the willingness of Michigan's philanthropic leaders to work together. Mr. Frank Dirks talks about the national influence of Michigan's philanthropic sector. Mr. Frank Dirks talks about how program officers become personally invested in their work. Mr. Frank Dirks graduated with a Bachelor of Arts from Washington College in Chestertown, Maryland. Mr. Dirks grew up in Washington, D.C. After college, he spent time teaching history, literature, and government to middle and high school students. As he taught, he began focusing on educating students in how to be responsible citizens. Mr. Dirks would take his students on government study programs through nonprofit organizations, and he recognized that upon returning home his students had no way to continue that civic engagement. This realization motivated his career change to join Youth Service America (YSA) in 1990 as a field organizer, where he connected with the W.K. Kellogg Foundation (WKKF). As a field organizer, he became involved in the formation of the Michigan Community Service Commission (MCSC). In 1992, following the creation of MCSC, Mr. Dirks worked as a program director for the Close Up Foundation. Close Up educates students to become active and informed citizens who understand the rights and responsibilities of living in a democracy. Soon after, in 1994, Mr. Dirks returned to act as executive director for MCSC until 1997. After moving to South Carolina to be with his wife, Mr. Dirks worked with the South Carolina Commission and the South Carolina Association for Nonprofit Organizations, hoping to use the lessons he had learned in Michigan, and to re-create some of his successes. However, he was largely met with resistance, and lacked the support and infrastructure that he had enjoyed in Michigan. Despite his efforts, Mr. Dirks didn’t see the progress for which he had hoped and began working with UBS Financial Services in 2004. His time within South Carolina’s nonprofit sector was not for naught however, and many of the changes and tactics he suggested are slowly being implemented there. 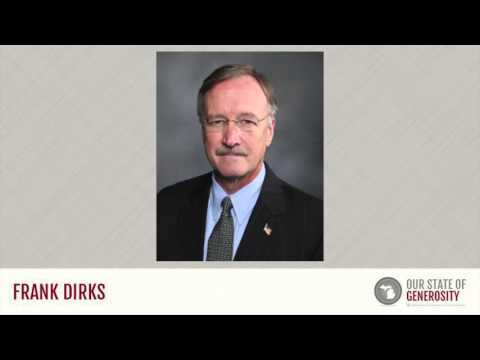 Mr. Dirks’ greatest contribution to the field of philanthropy in the state of Michigan is very likely his unflagging efforts in helping to create the Michigan Community Service Commission (MCSC) while employed with Youth Service America. One of the first steps in this undertaking was to convene the First Youth Service Michigan Conference, in response to the National and Community Service Act of 1990. This meeting included the K-12 community service projects, the Campus Compact, the Michigan Conservation Corps, and other youth and education-based service facilitators. Nearly all of these were grantees of the Philanthropy and Volunteerism programming area at the W.K. Kellogg Foundation, which WKKF Program Director Joel J. Orosz had been coordinating since 1988. Mr. Dirks was instrumental in this step, not only in communicating with the various parties, but also in writing suggestions for how the conference should be run. This conference demonstrated the interest in creating a commission entity, a project that quickly received support from a large number of foundations and interest groups throughout the state. Mr. Dirks also helped gain the support and involvement of Gov. John Engler, his staff, and the first lady of the state, Michelle Engler. Executive Order 1991-25 was signed by Gov. Engler in October 1991, establishing the creation of MCSC after almost a year of hard work by Mr. Dirks and numerous Michigan supporters, especially the Council of Michigan Foundations. The Michigan Commission was one of the first state commissions in the nation, formed in anticipation of the federal legislation that would create commissions in each of the 50 states. Mrs. Michelle Engler agreed to serve as the first chair of the commission. From 1991 through the election of Gov. Rick Snyder, the first lady or first gentleman (representing both the Republican and the Democratic Parties) have served as the Michigan Community Service Commission Chair (although retired W.K. Kellogg Foundation CEO and Chairman Dr. Russell Mawby served as chair during the interregnum between the Engler and Granholm administrations). This did not signal the end of Mr. Dirks’ labors on the project. In November of 1991, he penned a report to the newly formed MCSC in which he proposed a framework for the objectives, membership, and initial projects that the commission should follow. This framework met with a generally positive response from its members, and was used in the development of MCSC and for the construction of its grant application. Mr. Dirks later acted as executive director of MCSC from 1994 to 1997, and has served on its Learning Leadership Council and the Staff Advisory Council. Since its establishment in 1991, MCSC has earned its place as one of the primary infrastructure organizations in the state through its promotion of volunteerism and retention of volunteers, securing and granting of federal funds, facilitating communication between volunteer organizations, and the volunteer-centered research and evaluation it conducts. Since 1991, it has granted more than $100 million in public and private funds, and leveraged over $85 million in local resources to support community volunteer initiatives (1). Mr. Dirks was interviewed regarding his insights and experiences in working with Michigan’s philanthropic community and the Our State of Generosity (OSoG) partners. The following are selected quotations from his interview specifically related to the five organizing themes of the OSoG project.